If I had to pick one thing for everyone to do during their time in Boston, I’d probably tell them to attend the South Boston Street Festival. It isn’t necessarily the most fun thing to do in the city, and it doesn’t carry the obligatory blood alcohol content level that the South Boston St. Patrick’s Day Parade mandates (although you are certainly free to challenge that notion), but as an experience overall, it’s been one of the few that’s really stayed with me over the last four years. Part of this is because of the randomness of circumstance. I had no idea I’d be going to the festival when I went, and when I got there, I had no idea what to expect. My idea of Southie, founded mostly on the movies and Dennis Lehane novels, was far different from the reality. And so when my traveling companion went off to interview people for an article for the Free Press, I meandered about on my own, taking in the event on my own and finding that it was quite to my liking. The festival itself isn’t anything out of the ordinary. There are street vendors, community groups looking for membership, food, drinks, and a stage for music and dancing. It stretches a few blocks of East Broadway and runs for a few hours in the afternoon. The food is acceptable street grub, sausages, sandwiches and other snacks (I couldn’t find a funnel cake to save my life, but perhaps I wasn’t looking hard enough), and Guinness is available at every street corner bar within eyesight. It’s a perfect recipe for a easily enjoyable afternoon, but still it becomes something more. It ends up being the particulars of the area that make the festival so enjoyable. The people selling their paintings on the sidewalk who are more than willing to talk to you about their artistic war against the government. The toddlers in ‘Southie Pride’ shirts. The people watching from the porches of their homes, enjoying the weather and taking it all in. More than anything else, you get a strong sense of community from the street festival, and that’s what matters. You see people talking to one another, laughing and enjoying life together, but actually being sincere about it. This isn’t just small talk. These are people that know and care about one another. When Thomas Park (Southie’s premier classic rock cover band) plays “Sweet Home South Boston” and tweaks the lyrics to honor a fallen neighborhood hero, it isn’t cheesy, it actually means something. I, being a somewhat southern man, take my Skynyrd seriously, but I was won over by this rendition. I could tell the band and the audience meant every word of what they were singing and saying. It is an honesty and respect that isn’t easy to come by. I was once told by a half drunk ex-Bruins player that the reason he loved Boston was because he felt that it was “the biggest small town” in the world. I liked that idea. 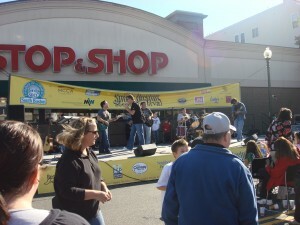 That, more than anything, is the reason I’d go to the South Boston Street Festival. It gives us an idea of the meaning of a community that many of us (myself included) have never felt before. 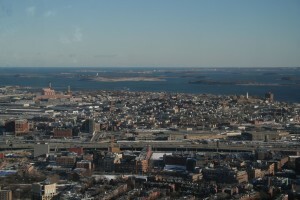 It also gives you the chance to see Southie, an area of Boston that has been somewhat unfairly saddled with a bad reputation, as a real, living and pleasant place. A place where things may not always be great, but where people know and care about one another, and things are all okay in the end because it’s a community that lives together. It’s something to see.